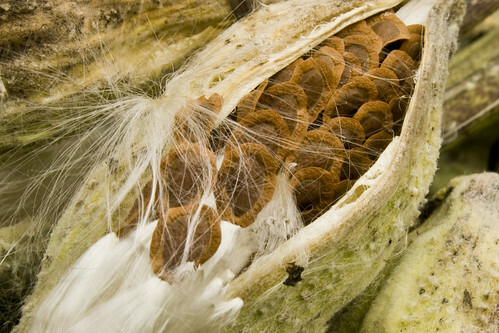 When I was six years old or younger, I made my father eat milkweed fluff. I know I was six or younger because we moved into our second house in the middle of my sixth year. In my brain I can see the bowl of milkweed seeds cooking in the old microwave of our first house. The first house was also near to several clumps of milkweed plants. (Our second house was in the woods, an area too shady for milkweed.) I remember coming back from a park, looking at the fluffy white silk bursting out of the brittle brown pods, and thinking that it looked good to eat. Maybe it reminded me of cotton candy or mashed potatoes. I asked my dad if milkweed seeds were ok to eat and he said it probably wasn’t harmful, so I harvested several handfuls to bring home. They were too dry to eat raw. I decided we should microwave the cottony bundle in a bowl of water. I knew that milkweed could be poisonous. My family would raise orange monarch butterflies from caterpillars, catching them to enter chrysalises in the safety of a glass jar. Monarch butterflies get their protective toxicity from the milky juices of the plant. I asked my dad to try to try the heated milkweed first. He indulgently acquiesced, taking a tiny pinch and chewed it dramatically. I could tell he didn’t like it much. Maybe if we added butter? No. Dad had had enough. My dad doesn’t remember any of this, but it sounds likely to him. It turns out that you can eat milkweed and that the inner white floof is one of the tastiest parts, but only if eaten immature, before it gets all fibrous. According to Samuel Thayer of The Forager’s Harvest, milkweed pods are best harvested when they are approximately two-thirds their full size. The entire pod is edible, but the silk, moist and soft at this stage, becomes delightfully chewy when boiled. “Mixed with other foods, the boiled white looks, tastes, and behaves surprisingly like melted cheese,” writes Thayer. I’ve got to try this.